None of us want to consider that Arendt’s “banality of evil” could ever apply to us. We think “wickedness” fits only extraordinary people. We don’t want to wonder if Solzhenitsyn’s dividing line truly could lie in our hearts. It has to be elsewhere, among clearly defined groups, clearly differentiated from us. When we look at Adolf Hitler, we see great evil and we long to separate ourselves from it. We want to do everything we can to disassociate ourselves from him in every way. This is understandable; this is also dangerous. By reducing him to a mere monster, we miss the danger to ourselves. We miss the danger from ourselves. It’s not hard to see why his image is used in this way. Adolf Hitler is arguably the most hated man of all time. While there are others – Mao, Genghis Khan, Stalin, Leopold II, – with an equal or even greater claim to “history’s worst butcher,” there is something about the National Socialist leader which leads us to use him as shorthand for all that is evil in the world. And yet, this very real villain with very real victims has, in popular culture, taken on all the characteristics of a cartoon, a two-dimensional entity with no real attributes beyond the most superficial of stereotypes. Like a reverse image of the way we tend to think of Christ as the personification of all that we like, regardless of what He actually said or thought, we’ve reduced Hitler to a cypher. He is for us a facsimile of the real evil man on whom we may freely place our fears, our hatreds, and, most importantly, the faces of our contemporary rivals. In doing this we make ourselves feel safe, safe from the fear that we, too, could be capable of great evil. We should all be for cutting down to size a definitively prideful guy. The likes of Mel Brooks, Charlie Chaplin, and “Hogan’s Heroes” provide delightfully incisive rebukes to this Übermensch. But, think about it for a minute: If Hitler and his Nazi minions were as obviously foolish as we make them out to be, if they were so buffoonish and dullard-like that only a great fool could fall for them, then how did he manage to hoodwink the most educated nation in the world? If even fickle teenagers today are capable of seeing through their smokescreens, then how did Germany’s sturdy butchers, bakers, and candlestick-makers fail to realize the danger? A lot of attention goes to Hitler’s ability to channel people’s hate, and rightly so. He was able to shape the resentment, anger, and humiliation of millions of people into something he could use, something he could brandish as a weapon of his own inner turmoil. But to focus on this alone is to miss the other part of his appeal. He didn’t just appeal to their hate; he appealed to their hope and to their pride. Hitler told the German people that they were special. They weren’t just anybody, but the one nation blessed by Fate to lead the world. The hatred of lesser peoples was nothing but envy, and the only reason they were not astride the world even now was because traitors and false friends were keeping them down. Hitler gave them grand spectacles and visions of a beautiful future which they only had to reach out and take. If we think only the ignorant, the hateful, and the easily swayed could be so taken in by fawning praise and stoked resentment, then it is we who are the great fools. In the same way, we separate ourselves from our contemporary neighbors and rivals by conflating them with this shallow caricature. The problem is, in a perverse reversal of Syndrome’s dictum, if everyone is a Nazi, then no one is. This watered-down image of Hitler and his henchmen makes for easy laughs among likeminded people, but it does a disservice to those whose supposed crimes do not approach the Holocaust, and it denies the reality and pain of those who truly did suffer under the Nazi regime. The victims of Auschwitz have more meaning and dignity than to act as pawns in our electoral prospects. More ominously, by lumping together any who dissent from our pet programs with our convenient view of Hitler, we excuse ourselves from self-reflection or confession. If only simpletons could fall for the menace of Nazism and our political opponents are “literally” Nazis, then we need never bother to listen to what they have to say or dare to question whether it is truly us who possess the truth. If evil is born of ignorance, and we “obviously” are not ignorant, then neither need we fear becoming evil ourselves. Bear in mind that since among his fiercest rivals were those who rivaled him in depravity, opposition to Hitler was no guaranty of elevated morality. This should give us pause when we “Nazify” everyone who disagrees with us as a pretense of our own innocence. If the title didn’t give it away, what would you see in the photo at the head of this article? You’d see a little boy, as sweet and fussy as any other. This isn’t a monster; this is a baby, a baby whose mother loved him and whom he loved in return. When he became a man, he was good with children and loved animals. He was a vegetarian, non-smoking teetotaler. Not exactly the sort you’d expect capable of doing what he did. The thing is, we have to deal with the fact this baby’s name was Adolf Hitler, and we have to face what happened next. As sweet as he may have been as an infant, later he was to willingly cause the deaths of millions of human beings in megalomaniacal war, bring down his own nation to rubble by his vanity, and desecrate through word and deed an astonishing number of image bearers of God Himself. 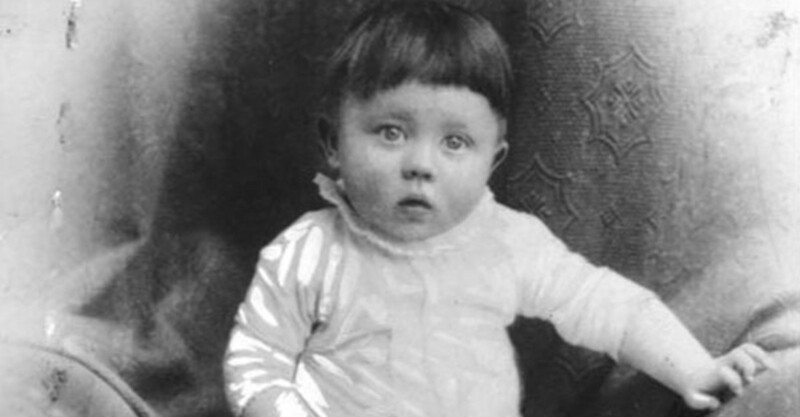 We don’t want to think of Hitler as a cute little baby. We want to see him as a monster, a demon, a buffoon. We do this because we’re afraid. We’re not afraid of him. Thankfully he’s long dead. No, the scary thing about Hitler isn’t that he was somehow inhuman but that he wasn’t. When we look at the face of this evil man, we are looking at someone just like us. And this makes us uncomfortable. We’d prefer him as a cartoon or a bogeyman. Rather than seeing him as a corrupted fellow image bearer, we treat him as a punchline, an easy insult, a stand-in for times when actually engaging with our socio-political opponents seems too tiring or too pointless. If familiarity breeds contempt, then our over-familiarity with comparisons to this contemptible person has sapped these analogies of their rhetorical power, changing what should be a robust simile into a bloodless bite. By reducing the reality of Hitler’s evil to a shape-shifting invective, we harm not just history but our understanding of ourselves. You see, the trouble with Hitler is that he wasn’t an alien, a lunatic, or a monster. He was a human being, just like you and just like me. And that’s terrifying. No matter how much we try to avoid or deny it, we cannot escape the Adamic heritage binding us to this vile man. The original sin which Hitler nourished, treasured, and incarnated like few others is present in each of us who, like him, bear the effects of Eden’s Fall. Frighteningly enough, the glory of the image of God in which we rightfully rejoice as our dearest possession, remained in him, no matter how much he marred, denied, and disused it himself. Comparing ourselves to Hitler is comforting. After all, who’s as bad as him? But doing this will do us no favors, in this life or the next. In the present this will lead down the road of hubris, making us think we have nothing to fear in our own fallen natures. In the life to come, it will lead us down the road of good intentions, and we know where that ends. We like to excuse our sin, saying that at least we’re not Hitler. This is true, but this is futile. Relying our own goodness as a measure will earn as much good in the end as did Hitler’s depravity. Our only hope, as the old song goes, is built on nothing less than Jesus’ blood and righteousness. After all, as the “good book” says, while we were still sinners, Christ died for us. There is our true comfort.